The 2017 Fairbrother Lecture is now open for bookings. This y ear’s lecture, taking place on 14 March 2017 (7 pm), will be delivered by Ruth Barnes, a final year doctoral researcher from the Department of Food and Nutritional Sciences. 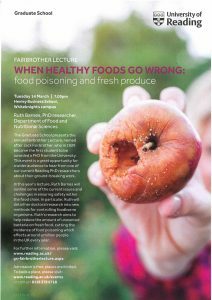 In her lecture (When Healthy Foods Go Wrong: food poisoning and fresh produce), Ruth will be discussing some of the current issues and challenges in ensuring safety within the food chain. In particular, Ruth will discuss her doctoral research into new methods for controlling food borne organisms. This research aims to help reduce the amount of unwanted bacteria on fresh food cutting the incidence of food poisoning which effects around a million people in the UK every year. The event will also feature a visual display of other high quality doctoral research. The Fairbrother Lecture is a University public lecture established in 2014. Named after Jack Fairbrother, who in 1929 became the first student to be awarded a PhD from the University, the Fairbrother Lecture is an annual event at which a current, or recent, Reading doctoral researcher presents their work to a wider audience. Members of the public, along with members of the University are invited to attend what promises to be a fascinating evening. Booking information is available via the link below.